In our previous post about when to upload your book files based on your launch date, you may have noticed that during your 5-day launch period, we recommend giving the e-book version away for free. Why would you give away something that you’ve invested so much time and money in? Great question—and we’ve got two great reasons (of course). 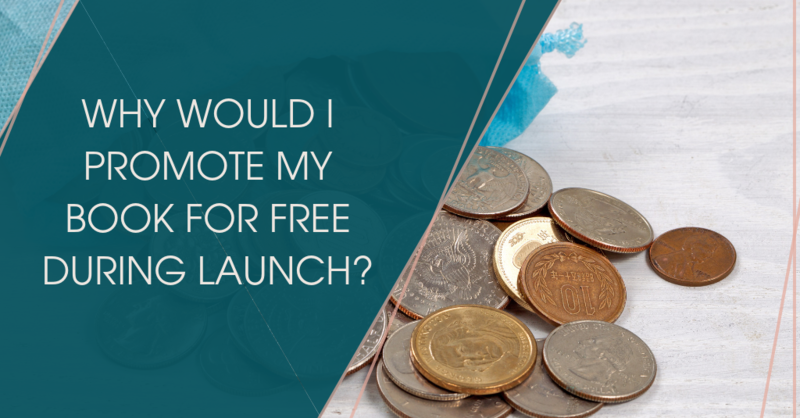 During your 5-day launch period, you want as many eyes on your book as possible. What’s the easiest way to do that? Offer the e-book for free and (via social media + your email list) request that people rate and review the book on Amazon ASAP. The more positive ratings and reviews you have, the more Amazon will share your book (aka free promotion!) with people searching for the topic of your book (based on the categories your book is listing in on Amazon). With Amazon promoting your book, thanks to your numerous positive ratings and reviews, you’re going to have people who have never heard of you finding your book. While offering the e-book for free is an enticing way to get them to read and share your book (who doesn’t love free!? ), we don’t want folks to download the book and never follow you again. How do we keep them in your world? In the front of the e-book, there will be a page with details about a freebie you’re offering, related to the content of the book itself. The URL will be visible to anyone who looks at the preview of the e-book on Amazon. Wait, they can sign up for the freebie without downloading the e-book? Yes indeed they can, and that’s a good thing. Having numerous positive ratings and reviews on Amazon is important for the long-term success of your book, but what’s even more important? People on your email list are considered “warm leads,” meaning they are already interested in what you’re doing and the most likely people to buy your next book, workshop, e-course … etc. A bigger email list, with people who are genuinely interested in your topic and perspective, is an important basic to growing your business and your platform as an author. While social media is more popular than ever, email is still the easiest way to connect with people as directly as possible online. More often than not, if people download your freebie, they’ll go back and download your e-book or buy a physical copy of your book to dive deeper into your topic of expertise. Your 5-day launch period, featuring for e-book for free on Amazon, is not the be-all end-all for promoting your book – it’s just the beginning. You’re planting seeds to help more people discover your book and your world over time. Positive ratings and reviews provide others with vital social proof that your book is worth their time. Your freebie, available to everyone, is an opportunity for people to sample your insights before they commit to downloading or buying your book, just like sampling foods at the grocery store. Need more good news? Amazon makes it super-simple to automatically set your e-book as free for your 5-day launch period. After your launch is over, Amazon will change the price of the book back to the retail price you originally chose when you uploaded your files.